Upper School service learning group New Ocean Blue's mission is to educate the community about the ocean's plastic gyres problem, promote the use of sustainable materials, and initiate preventative cleanups. Last week, instead of traveling to present at a local elementary school, students had the opportunity to share their message on campus. 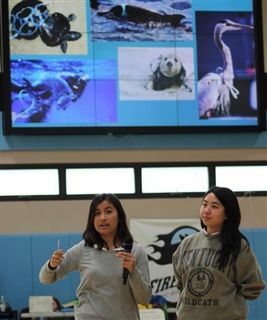 During Middle School Community Life, the group shared the impacts of plastic pollution and urged 7th and 8th graders to be part of the solution by reducing plastic use, recycling, and volunteering for beach cleanups.